I was so busy yesterday I didn't get to uploading this....I had it ready though! lol This was a tutorial on Splitcoast last week. It really is easy to do, especially if you have a Scor-Pal. 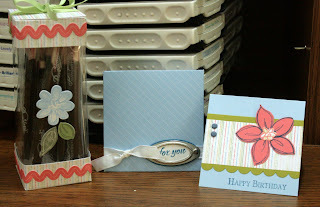 The 3x3 card and the box is using old SU retired paper, the stamp set is Delight in You from a couple years ago. The envelope I made with my Enveloper and silver hodge podge. The enveloper sounds fantastic--custom envelopes right? Gotta try that baby out one day. Nice blog!